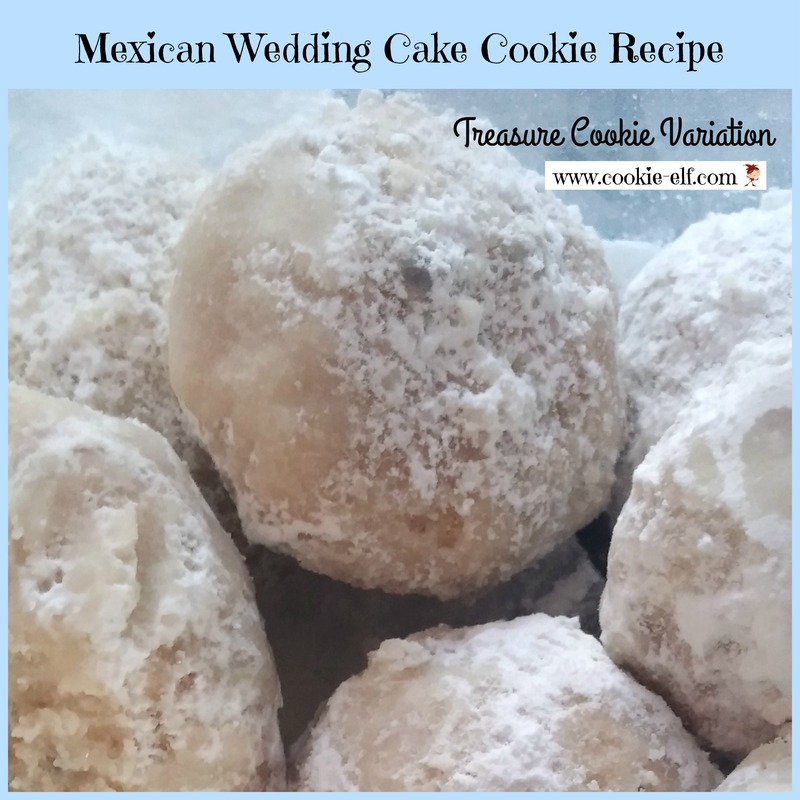 This Mexican Wedding Cake Cookie recipe is an easy version of the more traditional round, powdered cookies that are popular not just during the holidays, but at special occasions like weddings, showers, and christenings. Sometimes called “Treasure Cookies,” these luscious little snowballs include miniature chocolate chips – the “treasure” inside the pure white exterior. And the insides of the cookies are soft, rather than crumbly like shortbread – a tribute to brown sugar and less flour in the dough. Soft dough = easier to form into balls. In a medium bowl, using an electric mixer on medium speed, cream butter and sugar until light and fluffy, scraping the bowl continually, about 1-2 minutes. Mix in vanilla. Reduce speed to low. Gradually stir flour into creamed mixture a bit at a time until well blended, scraping the bowl constantly. Add in nuts and chocolate chips. Scoop dough into scant 1-inch balls and roll them in between the palms of your hands until smooth. Place balls in 2 inches apart on an ungreased cookie sheet. Bake cookies for 12-15 minutes until they just begin to brown. Pour about 1 cup powdered sugar into a medium bowl. Remove baking sheets from the oven. Quickly transfer cookies to the sugar-filled bowl. Roll cookies in the powdered sugar, using a slotted spoon to turn cookies and coat them completely. Remove cookies them from bowl and transfer to a cooling rack. Softer dough means these cookies may spread a bit if it’s rolled into large balls. Be sure to keep cookie dough balls small when rolling them. These cookies are soft after baking. Roll them in powdered sugar 3-6 at a time to make sure they don’t break up. They will get firm as they cool, but they need to be rolled with sugar while warm so sugar adheres to the surface. See more easy molded cookies on our Molded Cookies Pinterest board.